I saw the black shiny car in its perfectly renovated state driving down San Vicente in Brentwood. That car is an old friend, I thought for a second. This new tricked-out version brought me straight back to the late 1950’s when I was first introduced to it. I was driving and it was hard to concentrate on both the road and the flood of memories at the same time. I was holding back tears when I lowered my window to yell to the new owner, “Hey, that’s my car!” Well, not technically mine anymore, but it was my mother’s, we had it my ENTIRE life. I miss that car and I’m sorry I never drove it. The new owner convinced me he is taking very good care of it and loves it. For years, I kept harboring that sedan in various garages where I lived. Most people get to inherit small, valuable items, like rings. Not me. 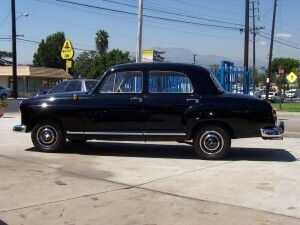 I got the beloved, vintage Mercedes. It had only one owner and that was my mother. I was still a child when our Mercedes Benz came from the dealership to our parking spot; a day I will never forget. It was 1959. I was six years old. That vehicle holds more sentimental value to me than any ring. 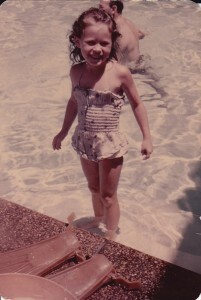 As a little girl, I loved to swim, still do. Just about any chance I got to go swimming, I would. I dreamed of having my own pool. My bigger dreams were to be an Olympian swimmer and also to swim the English Channel. 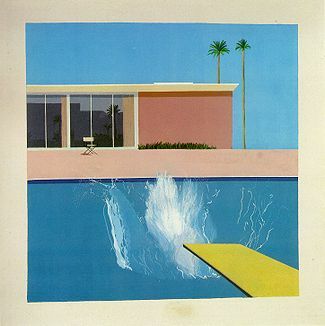 Pools and water became an obsession as well as a love. I would look into my backyard and fantasize a swimming pool. It never appeared. My dad always lived in an apartment building with a pool so there was usually a place for me to swim. When I was older and using his for exercise, I would have to share it with his elderly neighbors. They could get nasty and it was tricky navigating around their crankiness. Some of them became my new best friends in life … as long as we stayed in our own lanes. When I saw the David Hockney series of pools, I totally understood how the swimming pool was his muse. When I was a freshman in high school and was forced to swim, I often lied and said I had my period, which in fact I really didn’t get until my sophomore year. I felt more comfortable and relaxed holding my breath under water than just about anywhere else. I wasn’t really aware of how therapeutic it was, but swimming under water there put me in a serene state, one I have never found again. You are currently browsing the Channeling The Food Critic in Me blog archives for March, 2011.